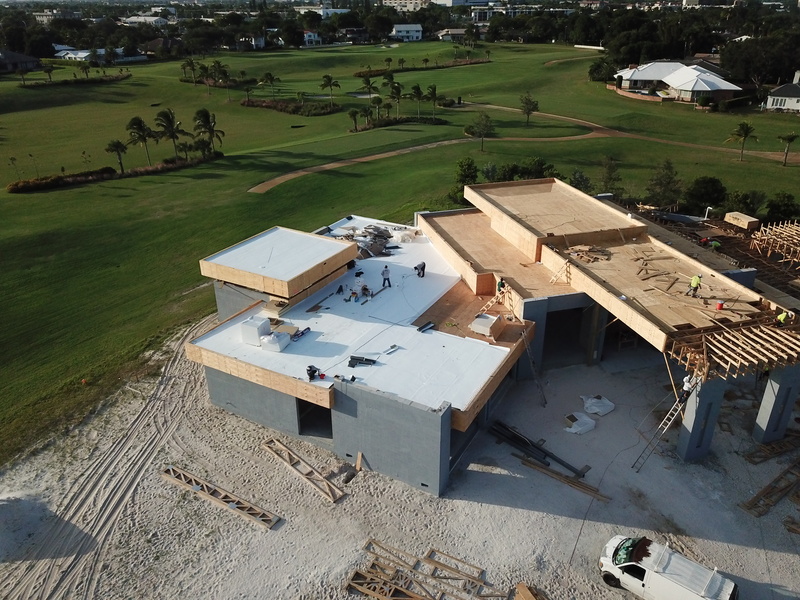 A Fort Lauderdale homeowner in the brand-new championship golf course community outside Coral Ridge Country Club contacted Perkins Roofing to install a flat roof on his new construction 26,580 square foot residential lot. The homeowner held a goal to expedite his move-in date. Perkins Roofing was up for the challenge. Working diligently alongside other construction contractors to build the Novovic Residence from the bottom up, Perkins Roofing delivered fast and professional roofing services to the project in time for the homeowner to meet his move-in goal. For this new construction roof, GAF EverGuard Thermoplastic Polyolefin (TPO) 60-mil membrane was used along with a tapered insulation system. SecurRock, a fiberglass board, was used to create a water intrusion seal at the seams per Miami-Dade construction code. Termination bars, stucco metal, eave metal, and coping caps on the parapet walls were installed where necessary. All work is backed with a Perkins Roofing 10-year warranty and a 20-year GAF product warranty. Tim Kanak, Perkins Roofing Vice President and licensed drone pilot, monitored the project progress by frequenting flying a drone to obtain a full aerial view of quality control and also for the customer’s ease of mind. The Novovic Residence roof is now complete and Perkins Roofing is happy to play a part in being this homeowner’s trusted South Florida roofer. Looking for a new construction roofing contractor? Contact Perkins Roofing for your free estimate.